Our proposal for the Nobel Center is to create an open public park which can be used during all seasons. We aim to create a place where people can casually visit to learn about the Nobel Laureates and their contributions, or to simply relax in the open and friendly environment. The Nobel Center is a temperate park with direct public access to the waterfront. 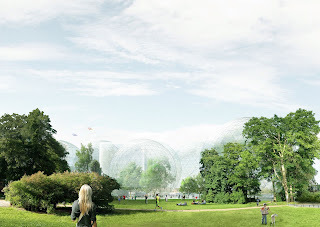 During the summertime, the interior is shaded and naturally cooled to create comfortable and calm interior spaces, whereas in the cold dark winter months, the gently glowing spheres becomes a beacon in the city, providing pockets of large warm spaces as an escape from the harsh climate outside. Everyone is welcome all year in the Nobel Center making it an important public forum and active center for Stockholm city. 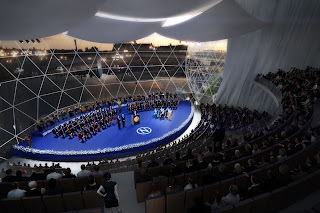 Events and activities happen in the soft spheres all year-round with excitement culminating at the Nobel Prize Ceremony every December. 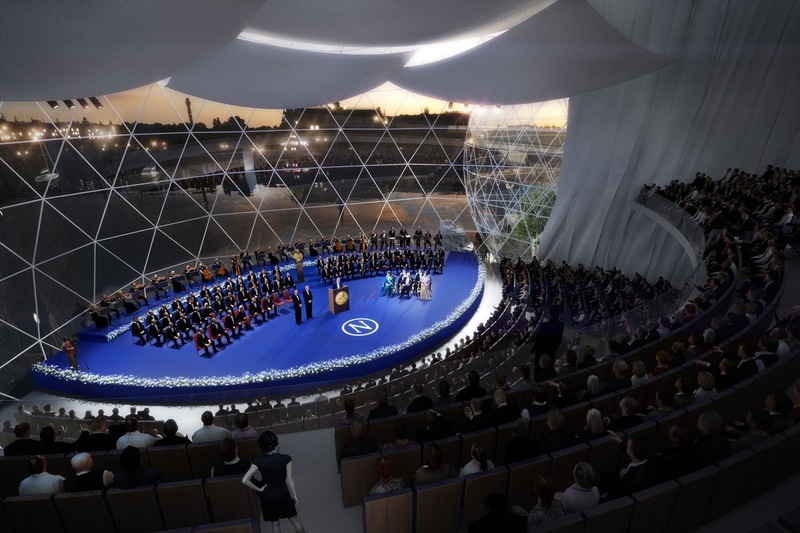 During this special ceremony, the auditorium configures into one large space with spectacular panoramic views of Stockholm as a backdrop. The ceremony is revealed and opened up to the city like never before, transforming the event into a city-wide celebration. 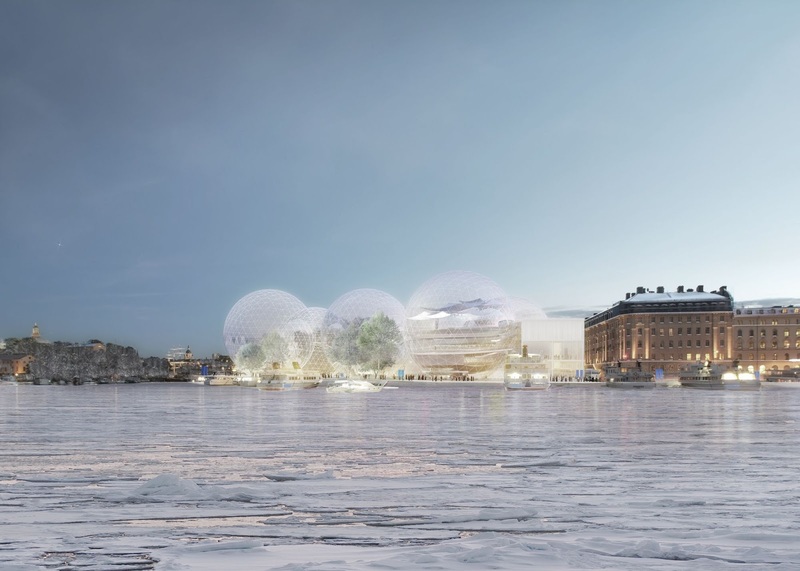 The Nobel Center, located at the Blasieholmsudden peninsula is a gathering of 6 soft sphere- like volumes of varying heights to reflect the undulating heights of the Stockholm skyline and surround waters. The spheres lightly nudge, stack, and intersect with one another leading to a collection of spaces with soft connections to all sides. The resulting volume is a unique, transparent, and light building, nestled in between the park, water and National Museum. All city traffic is directed towards the Strokajen with the drop off, bus zone, and parking ramp concentrated on Hovslagargatan to create a car-free zone at the waterfront. By keeping a portion of the quay free of boat moorings, the people feel more connected with the water, and offer unobstructed view towards Strandvagen, Djurgarden and beyond. In tandem with the urban scale and context, the grandeur of the spheres derives from the ambition to create a zero energy building and indoor park. The large diameters provide height and unimpeded exposure to the sun, but also create temperature stratification within the volume which helps to circulate the air more easily. The geometry of a sphere, yields large enough perpendicular surface area for photovoltaic membranes, that when coupled with the other sustainable energy systems, we are able to reach a zero energy building. The retractable photovoltaic membranes act as shading for added thermal comfort but its transparency allows for continuous visibility towards the outside to always feel connected with the exterior environment.